Desktop computers despite being big often lack good WiFi, while some don’t even come with built-in wireless. Even if a desktop does have wireless built-in upgrades such as Windows 10 can cause it to stop working. 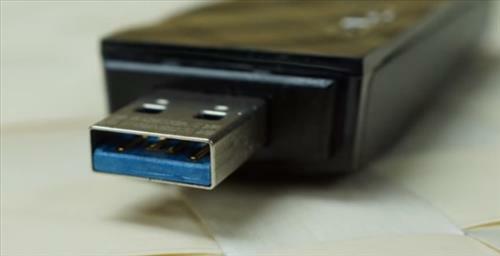 One sure work around that is quick, easy, and cheap is a USB wireless adapter/dongle. 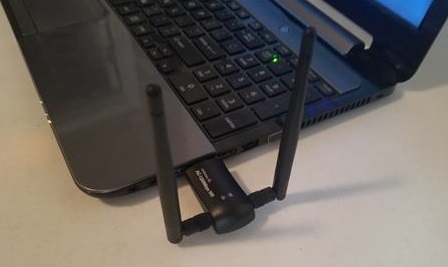 WiFi dongles come in all shapes and sizes and can even upgrade an older PC to new protocols. Below is our picks for best wireless USB dongles with links to the reviews. As always be sure to also read reviews on Amazon, forums, or elsewhere to be sure a unit is the right pick for you. The Alfa AWUS036ACH is a 802.11AC unit built for fast WiFi speeds and distance. It comes with two 5dBi antennas that greatly improves a wireless signal. It is also compatible with most any Operating System from Windows 10 to Kali Linux. In our test it worked out of the box with Win 10 basically plug-and-play with some impressive wireless speeds, 213Mbps Download, and 21Mbps Upload. Alfa USB adapters are notorious in the Pen Testing/Hacking community for their strong Chipsets and screw on antennas that can be easily changed out for larger ones. If you have a desktop PC that needs better WiFi coverage than this is a good adapter to get. The USBNOVEL 1200 is an 802.11AC dual-band USB WiFi Adapter built for fast transfer speeds and distance. 802.11AC is currently the newest wireless protocol working in both the 2.4GHz and 5 GHz bands. It is backward compatible so will also work with older devices. While testing the the 5Ghz band had a transfer speed of 216Mbps Download, and 21Mbps Upload. 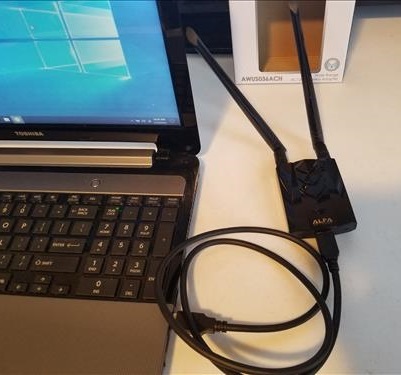 The BrosTrend AC1 is a Dual Band 802.11AC WiFi dongle that works very well with Windows 10 or 7. Since it is Dual Band, 2.4 GHz / 5GHz, along with the new 802.11ac WiFi protocol it will fit into any wireless network, old or new. This unit from Glam Hobby is a 802.11ac Dual Band dongle so it has all the newest protocols. In our test it had a download speeds of 98MBps which is very good for such a small adapter. Its small size will limit the range to about that of a laptops built-in WiFi but this also helps keep it out of the way. The compatibility is also good with Windows XP, Vista, Win 7, Win 8, and Windows 10. For those who just need a very low cost wireless dongle to get online quick the Panda Wireless PAU06 is worth a look. It wont break any download speed records but it stayed at a solid 51Mbps Download in our test. The small antenna helps give it better range than other low cost units. The compatibility is good with support for Windows XP, Vista, 7, Win 8, Win 10, Mac and Linux. It is only a Wireless-N dongle so it doesn’t have the latest technology but will have your desktop online wirelessly at a low cost. The Panda PAU05 is not a new USB wireless adapter and has been available for awhile. The reason the Panda Ultra makes the list is the low cost and ability to work with any version of Windows. In fact the creators have made this dongle compatible with most any type of hardware form a Raspberry Pi to Windows 10. The downside is its a Wireless-N adapter and doesn’t use the new 802.11ac. It also isn’t a large adapter so the range is about the same as a built-in laptops WiFi. If you need a cheap USB adapter that has a easy Plug-and-Play setup that will work with most any version of Windows than this is a good one to get. The Panda Wireless PAU09 is a Dual Band Wireless-N dongle. It also comes with two large 5dBi antennas to improve performance. The one downside is no 802.11ac support. While it has no 802.11ac support it is dual band Wireless-N making it able to work in most any WiFi network. 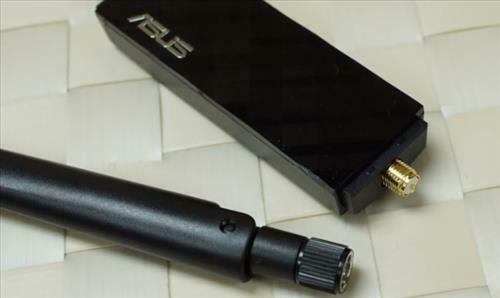 Asus USB-AC56 is a dual band dongle that can run at speeds up-to 1300 Mbps. 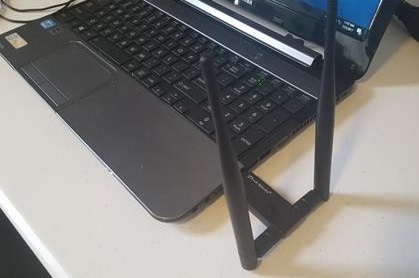 This makes it a fast wireless adapter. It uses the new 802.11ac protocol at 5 GHz to transfer data at 867Mbps and 2.4 GHz for 300 Mbps. It also comes with a High-Gain antenna for better range. The USB-AC56 comes with a cradle that can be used if needed and the antenna moved about to get the best signal possible. If you need a USB adapter for a fast WiFi connection than the Asus USB-AC56 is a good one to get. The Dodocool N300 is a budget Wireless-N 2.4Ghz USB adapter. While it does not have the latest technology it is very low cost and would fit into most any network. It is a small unit with a cap and built-in LED that flashes when connected to the WiFi. During testing the WiFi speed was 89Mbps Download, and 21Mbps Upload. 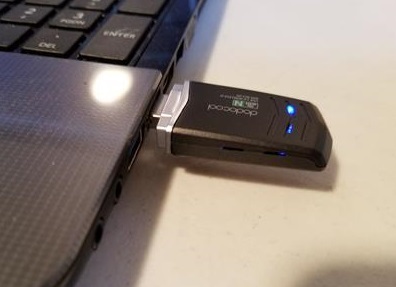 Setting up a wireless USB adapter for your desktop computer is a easy task that can make life easier when it comes to data transfer. USB WiFi dongles are cheap and come in all shapes sizes and compatibly. When looking for a good one be sure it is compatible with your version of Windows and does what you need form it. For example if you internet speed is slow than there is no need for the fastest wireless dongle. If you are gamer though speed will be a big factor. Since everyone will have a different setup and wireless environment always be sure to read the reviews on Amazon or elsewhere to know the adapter is a good fit for you. These type of reviews and informative but what it is lacking is a matrix that compares feature sets and capabilities so a reviewer can focus in on the item that meets their needs. Adding a matrix with the wireless range, wifi protocols, single or dual band, and cost points would really help the reader understand the reviews holistically rather than requiring the reader to generate a spreadsheet on their own. Hi, I have an Asus AC68U router but my computer’s internal adapter is wireless N. I don’t really care about speeds as what I have is fast enough. Wondering whether buying the USB adapter will improve game latency & range?